Lt. Col. Mike Daniels is the Director of Public Affairs for the Rocky Mountain Region of the Civil Air Patrol – U.S. Air Force Auxiliary and Editor-in-Chief of the Rocky Mountain Region’s Altitudes magazine and Colorado Wing’s Peaks & Planes magazine. 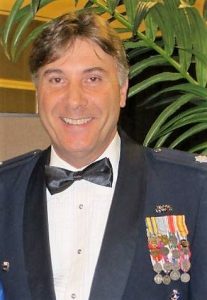 In his 21 years of Civil Air Patrol service he has served as the Colorado Wing’s Director of Public Affairs, Group Staff PAO, Squadron Commander and Squadron PAO. In 2014 he was awarded the Civil Air Patrol’s Col. Robert V. Payton Public Affairs Officer of the Year recognizing him as the best in the nation. Mike is a decorated U.S. Air Force veteran, graduate of the Defense Language Institute and holds a Master’s Degree in Public Administration in non-profit organization management that he earned at the University of Colorado and Harvard University. Mike has worn many hats outside of the Civil Air Patrol and is the President of the Colorado Independent Publishers Association’s 501 c 3 Education and Literacy Foundation (CIPA ELF) which he helped create while serving as President of the Colorado Independent Publishers Association in 2005-06. Since 2007, CIPA ELF has partnered with Colorado Rotary Clubs and other nonprofit groups to donate over $150,000 worth of new books to Colorado schools, libraries, hospitals, shelters and more. Mike is also a past President of the Intermountain Humane Society, former Board member of the Rotary Club of Conifer and the club’s Rotarian of the Year in 2008-09. He has performed on stage with various theater companies in Colorado and has been a contributing writer for several Colorado periodicals including A Sheltered Life magazine which helps support homeless animals at Colorado animal shelters and rescues. In his pursuit of public service, Mike was his party’s candidate for the Colorado Legislature in his district for the House in 2006 and the Senate in 2010. He has been employed in the book publishing industry for the last two decades where he works with authors and publishers now as a Publisher’s Coach to provide strategic and creative guidance to help publish and market their books. Mike, himself, is a published author having published Living, Loving and Loathing: Modern Rhymes and Limericks for the Romantically Inclined and Humorously Correct, under his Good Knight Books imprint.